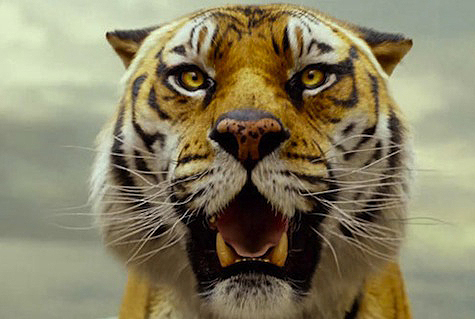 Knowing nothing about Yann Martel’s popular novel nor the film is probably the best way to see Ang Lee’s film of Life of Pi – which I did, and which probably makes me someone who’s been living under a rock for the past year. I’ve seen the book cover, heard of the title, listened to the score, met the composer, and yet it took a while to catch the film, but it was wholly worth the wait because by living under said rock, there were no preconceived ideas of the film beyond a sense of its spirituality (gleaned from the score) and something about a boy and a tiger on a boat. The book and film have undoubtedly affected people in different ways, and one would think this amalgam of survival, fantasy, adventure, emotional horror, and spiritualism just shouldn’t work, but it does because it seemed everyone managed to walk a very fine line in not making the film from a single (narrow-minded) vantage, and keeping a hard focus on the boy and the tiger. Having not read the book, the script nevertheless feels like a perfect adaptation because everything flows so neatly, yet without any portent of things to come. It also offers a unique finale that basically tells viewers it’s okay to believe in one’s own interpretation of the boy’s epic ocean journey. It’s also a film in which South Asians aren’t portrayed as Hollywood caricatures, filled with mysticism and steeped in a staid culture. Within Pi’s family, there is dialogue, differences, and conflict, and spiritualism isn’t this thing that seeps from every word or scene; it’s just a translucent cloud that once in a while deepens in colour and affects a scene with a specific narrative purpose rather than ethnic atmosphere or ‘colour,’ which is important considering Hollywood like to portray Things Asian and Things South Asian as all murky, mystical, and really, really old. Pi’s family is clearly upscale and influenced by the colonial power of the time (France – which seems weird, considering the bulk of the Indian provinces were manhandled by the Brits) but they maintain a life that’s progressive and spiritual, liberal with conservative elements – perhaps a glaringly modern take by the author rather than a slice of the times – but it doesn’t take away from the Indian character. Some might see a rather white version of the culture from that era / time period / setting, but I kind of see my dad and his family who share a lot of the same values. Being the son of a stubborn, sometimes argumentative black sheep with a Germamic fixation, the world of Pi isn’t an aberration or a fantasy, but a believable portrait of a normal family – things rather rare when Hollywood dips into foreign cultures. Uploaded is a review of the film [M] – I only had access to the DVD, which was a bummer – plus a review of Mychael Danna’s Oscar-winning score [M] from Sony Classical, and an interview with Rob Simonsen, who’s moved up from Danna’s assistant to a collaborator on scores like 500 Days of Summer, TV’s Dollhouse, and Life of Pi. In the podcast, Simonsen discusses his entry into film scoring, learning the ropes from Danna, and the business realities of a working composer. Those wanting some direct info from Danna won’t find a shortage of online interviews, but I’d suggest this CBC interview where Danna converses with Jian Ghomeshi, and a print piece in the Ottawa Citizen.